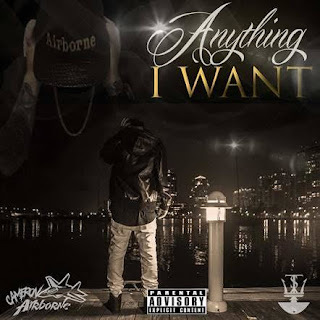 Cameron Flyer (Born April, 8th 1997) Better Known For His Stage Name "Cameron Airborne" Is An American Hip Hop Recording Artist. Originally Born In Long Island New York, The Rapper Later Moved To South FL At The Age Of Eight After The Divorce Of His Parents, Where He Has Resided Ever Since. Cameron Airborne Began Writing And Recording His Own Music At 12 Years Old. He Rarely Spent Time At Home And Often Had To Find His Own Ways To Make Money For His Family, Which Included Selling Drugs. Running Into A Lot Of Legal Trouble At A Young Age, Cameron Found Himself In And Out Of The Juvenile Detention Center. While Inside He Spent Majority Of His Time Writing Rhymes, Often Participating In Cyphers To Pass The Time. After His Release, He Wasted No Time Recording All The Material He Had Written Which Became The First Step Into Fully Embracing His Rap Career, And Soon He Followed Up With His Very First Project 'Lifted' In 2013. Going By Just 'Airborne' At The Time, He Spent Majority Of His Time At The Computer Sifting Through Instrumentals And Samples. Shortly After The Release Of His Project 'Lifted' He Followed Up With Another Project Titled 'Kamikaze' In 2014 Which Consisted Of Him Rapping Over Mainly DJ Premier Instrumentals, Giving It That 'Boom Bap' Hip Hop Feel. In 2015 He Decided To Make A Name Change Adding His First Name And Now Making It 'Cameron Airborne'. He Believed Adding His First Name Would Give A More Personal Insight To His Fans And Would Help Them Discover Who He Truly Is. He Spent The Next Couple Months On A Hiatus Building His Hype And Working On New Music While Strategically Releasing Music Videos. In The Summer Of 2016 He Went On To Release His Debut Project Under His New Name Titled 'Unspoken Words'. The Project Was A Success And Quickly Began Gaining Recognition With Singles Like 'Chosen One' And 'Grind'. He Began Releasing A Series Of Visuals For The Project Including A Visual For The Track 'Commas' Which Quickly Started To Go Viral On Facebook And Helped To Develop The Buzz That Is Building Today. In January 2017, Shortly After The Release Of 'Unspoken Words' He Went On To Release Another EP Titled 'Magic In The Air' Featuring Fellow Artist And Engineer Bmagic302. In That Same Month Of Releasing The EP 'Magic In The Air' In January 2017, He Gained A Spot On The 'Keep Flexin Tour' With Rapper 'Rich The Kid' Gaining Tons Of New Fans And Exposure. 'Cameron Airborne' Is Currently Working On Various Projects Set To Release As He Continues Working To Build His Name And Develop Himself In The Future.